Lean manufacturing or lean production, often simply "lean", is a systematic method for the minimization of waste (無駄 muda) within a manufacturing system without sacrificing productivity, which can cause problems. Lean also takes into account waste created through overburden (無理 muri) and waste created through unevenness in work loads (斑 mura). Working from the perspective of the client who consumes a product or service, "value" is any action or process that a customer would be willing to pay for. Lean manufacturing attempts to make obvious what adds value, through reducing everything else (because it is not adding value). This management philosophy is derived mostly from the Toyota Production System (TPS) and identified as "lean" only in the 1990s. [page needed],  TPS is renowned for its focus on reduction of the original Toyota seven wastes to improve overall customer value, but there are varying perspectives on how this is best achieved. The steady growth of Toyota, from a small company to the world's largest automaker, has focused attention on how it has achieved this success. Lean principles are derived from the Japanese manufacturing industry. The term was first coined by John Krafcik in his 1988 article, "Triumph of the Lean Production System", based on his master's thesis at the MIT Sloan School of Management. Krafcik had been a quality engineer in the Toyota-GM NUMMI joint venture in California before joining MIT for MBA studies. Krafcik's research was continued by the International Motor Vehicle Program (IMVP) at MIT, which produced the international best-selling book co-authored by James P. Womack, Daniel Jones, and Daniel Roos called The Machine That Changed the World. A complete historical account of the IMVP and how the term "lean" was coined is given by Holweg (2007). For many, lean is the set of "tools" that assist in the identification and steady elimination of waste. As waste is eliminated quality improves while production time and cost are reduced. A non exhaustive list of such tools would include: SMED, value stream mapping, Five S, Kanban (pull systems), poka-yoke (error-proofing), total productive maintenance, elimination of time batching, mixed model processing, rank order clustering, single point scheduling, redesigning working cells, multi-process handling and control charts (for checking mura). There is a second approach to lean manufacturing, which is promoted by Toyota, called The Toyota Way, in which the focus is upon improving the "flow" or smoothness of work, thereby steadily eliminating mura ("unevenness") through the system and not upon 'waste reduction' per se. Techniques to improve flow include production leveling, "pull" production (by means of kanban) and the Heijunka box. This is a fundamentally different approach from most improvement methodologies, and requires considerably more persistence than basic application of the tools, which may partially account for its lack of popularity. Both lean and TPS can be seen as a loosely connected set of potentially competing principles whose goal is cost reduction by the elimination of waste. [not in citation given] These principles include: pull processing, perfect first-time quality, waste minimization, continuous improvement, flexibility, building and maintaining a long term relationship with suppliers, autonomation, load leveling and production flow and visual control. The disconnected nature of some of these principles perhaps springs from the fact that the TPS has grown pragmatically since 1948 as it responded to the problems it saw within its own production facilities. Thus what one sees today is the result of a 'need' driven learning to improve where each step has built on previous ideas and not something based upon a theoretical framework. Toyota's view is that the main method of lean is not the tools, but the reduction of three types of waste: muda (虚無僧, non-value-adding work), muri (無理, overburden), and mura (斑, unevenness), to expose problems systematically and to use the tools where the ideal cannot be achieved. From this perspective, the tools are workarounds adapted to different situations, which explains any apparent incoherence of the principles above. Lean implementation emphasizes the importance of optimizing work flow through strategic operational procedures while minimizing waste and being adaptable. Flexibility is required to allow production leveling (Heijunka) using tools such as SMED, but have their analogues in other processes such as research and development (R&D). However, adaptability is often constrained, and therefore may not require significant investment. More importantly, all of these concepts have to be acknowledged by employees who develop the products and initiate processes that deliver value. The cultural and managerial aspects of lean are arguably more important than the actual tools or methodologies of production itself. There are many examples of lean tool implementation without sustained benefit, and these are often blamed on weak understanding of lean throughout the whole organization. All work shall be highly specified as to content, sequence, timing, and outcome. Every customer-supplier connection must be direct, and there must be an unambiguous yes or no way to send requests and receive responses. Any improvement must be made in accordance with the scientific method, under the guidance of a teacher, at the lowest possible level in the organization. Most of the basic goals of lean manufacturing and waste reduction were derived from Benjamin Franklin through documented examples. Poor Richard's Almanack says of wasted time, "He that idly loses 5s. worth of time, loses 5s., and might as prudently throw 5s. into the river." He added that avoiding unnecessary costs could be more profitable than increasing sales: "A penny saved is two pence clear. A pin a-day is a groat a-year. Save and have." Again Franklin's The Way to Wealth says the following about carrying unnecessary inventory. "You call them goods; but, if you do not take care, they will prove evils to some of you. You expect they will be sold cheap, and, perhaps, they may [be bought] for less than they cost; but, if you have no occasion for them, they must be dear to you. Remember what Poor Richard says, 'Buy what thou hast no need of, and ere long thou shalt sell thy necessaries.' In another place, he says, 'Many have been ruined by buying good penny worths'." Henry Ford cited Franklin as a major influence on his own business practices, which included Just-in-time manufacturing. The accumulation of waste and energy within the work environment was noticed by motion efficiency expert Frank Gilbreth, who witnessed the inefficient practices of masons who often bend over to gather bricks from the ground. The introduction of a non-stooping scaffold, which delivered the bricks at waist level, allowed masons to work about three times as quickly, and with the least amount of effort. Frederick Winslow Taylor, the father of scientific management, introduced what are now called standardization and best practice deployment. In Principles of Scientific Management, (1911), Taylor said: "And whenever a workman proposes an improvement, it should be the policy of the management to make a careful analysis of the new method, and if necessary conduct a series of experiments to determine accurately the relative merit of the new suggestion and of the old standard. And whenever the new method is found to be markedly superior to the old, it should be adopted as the standard for the whole establishment." Taylor also warned explicitly against cutting piece rates (or, by implication, cutting wages or discharging workers) when efficiency improvements reduce the need for raw labor: "...after a workman has had the price per piece of the work he is doing lowered two or three times as a result of his having worked harder and increased his output, he is likely entirely to lose sight of his employer's side of the case and become imbued with a grim determination to have no more cuts if soldiering [marking time, just doing what he is told] can prevent it." 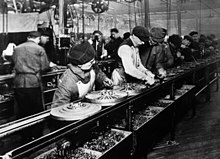 American industrialists recognized the threat of cheap offshore labor to American workers during the 1910s, and explicitly stated the goal of what is now called lean manufacturing as a countermeasure. Henry Towne, past President of the American Society of Mechanical Engineers, wrote in the Foreword to Frederick Winslow Taylor's Shop Management (1911), "We are justly proud of the high wage rates which prevail throughout our country, and jealous of any interference with them by the products of the cheaper labor of other countries. To maintain this condition, to strengthen our control of home markets, and, above all, to broaden our opportunities in foreign markets where we must compete with the products of other industrial nations, we should welcome and encourage every influence tending to increase the efficiency of our productive processes." Ford's success has startled the country, almost the world, financially, industrially, mechanically. It exhibits in higher degree than most persons would have thought possible the seemingly contradictory requirements of true efficiency, which are: constant increase of quality, great increase of pay to the workers, repeated reduction in cost to the consumer. And with these appears, as at once cause and effect, an absolutely incredible enlargement of output reaching something like one hundredfold in less than ten years, and an enormous profit to the manufacturer. I believe that the average farmer puts to a really useful purpose only about 5% of the energy he expends.... Not only is everything done by hand, but seldom is a thought given to a logical arrangement. A farmer doing his chores will walk up and down a rickety ladder a dozen times. He will carry water for years instead of putting in a few lengths of pipe. His whole idea, when there is extra work to do, is to hire extra men. He thinks of putting money into improvements as an expense.... It is waste motion— waste effort— that makes farm prices high and profits low. Ford's early success, however, was not sustainable. As James P. Womack and Daniel Jones pointed out in "Lean Thinking", what Ford accomplished represented the "special case" rather than a robust lean solution. [need quotation to verify] The major challenge that Ford faced was that his methods were built for a steady-state environment, rather than for the dynamic conditions firms increasingly face today. Although his rigid, top-down controls made it possible to hold variation in work activities down to very low levels, his approach did not respond well to uncertain, dynamic business conditions; they responded particularly badly to the need for new product innovation. This was made clear by Ford's precipitous decline when the company was forced to finally introduce a follow-on to the Model T.
Design for Manufacture (DFM) is a concept derived from Ford which emphasizes the importance of standardizing individual parts as well as eliminating redundant components in My Life and Work. This standardization was central to Ford's concept of mass production, and the manufacturing "tolerances", or upper and lower dimensional limits that ensured interchangeability of parts became widely applied across manufacturing. Decades later, the renowned Japanese quality guru, Genichi Taguchi, demonstrated that this "goal post" method of measuring was inadequate. He showed that "loss" in capabilities did not begin only after exceeding these tolerances, but increased as described by the Taguchi Loss Function at any condition exceeding the nominal condition. This became an important part of W. Edwards Deming's quality movement of the 1980s, later helping to develop improved understanding of key areas of focus such as cycle time variation in improving manufacturing quality and efficiencies in aerospace and other industries. While Ford is renowned for his production line, it is often not recognized how much effort he put into removing the fitters' work to make the production line possible. Previous to the use, Ford's car's components were fitted and reshaped by a skilled engineer at the point of use, so that they would connect properly. By enforcing very strict specification and quality criteria on component manufacture, he eliminated this work almost entirely, reducing manufacturing effort by between 60-90%. However, Ford's mass production system failed to incorporate the notion of "pull production" and thus often suffered from overproduction. Toyota's development of ideas that later became lean may have started at the turn of the 20th century with Sakichi Toyoda, in a textile factory with looms that stopped themselves when a thread broke. This became the seed of autonomation and Jidoka. Toyota's journey with just-in-time (JIT) may have started back in 1934 when it moved from textiles to produce its first car. Kiichiro Toyoda, founder of Toyota Motor Corporation, directed the engine casting work and discovered many problems in their manufacturing. He decided he must stop the repairing of poor quality by intense study of each stage of the process. In 1936, when Toyota won its first truck contract with the Japanese government, his processes hit new problems and he developed the "Kaizen" improvement teams. Levels of demand in the Post War economy of Japan were low and the focus of mass production on lowest cost per item via economies of scale therefore had little application. Having visited and seen supermarkets in the USA, Taiichi Ohno recognised the scheduling of work should not be driven by sales or production targets but by actual sales. Given the financial situation during this period, over-production had to be avoided and thus the notion of Pull (build to order rather than target driven Push) came to underpin production scheduling. I was first introduced to the concepts of just-in-time (JIT) and the Toyota production system in 1980. Subsequently I had the opportunity to witness its actual application at Toyota on one of our numerous Japanese study missions. There I met Mr. Taiichi Ohno, the system's creator. When bombarded with questions from our group on what inspired his thinking, he just laughed and said he learned it all from Henry Ford's book." The scale, rigor and continuous learning aspects of TPS have made it a core concept of lean. Although the elimination of waste may seem like a simple and clear subject, it is noticeable that waste is often very conservatively identified. This then hugely reduces the potential of such an aim. The elimination of waste is the goal of lean, and Toyota defined three broad types of waste: muda, muri and mura; for many lean implementations this list shrinks to the first waste type only with reduced corresponding benefits. To illustrate the state of this thinking Shigeo Shingo observed that only the last turn of a bolt tightens it—the rest is just movement. This ever finer clarification of waste is key to establishing distinctions between value-adding activity, waste and non-value-adding work. [not in citation given] Non-value adding work is waste that must be done under the present work conditions. One key is to measure, or estimate, the size of these wastes, to demonstrate the effect of the changes achieved and therefore the movement toward the goal. A typical example of the interplay of these wastes is the corporate behaviour of "making the numbers" as the end of a reporting period approaches. Demand is raised to 'make plan,' increasing (mura), when the "numbers" are low, which causes production to try to squeeze extra capacity from the process, which causes routines and standards to be modified or stretched. This stretch and improvisation leads to muri-style waste, which leads to downtime, mistakes and back flows, and waiting, thus the muda of waiting, correction and movement. The identification of non-value-adding work, as distinct from wasted work, is critical to identifying the assumptions behind the current work process and to challenging them in due course. Breakthroughs in SMED and other process changing techniques rely upon clear identification of where untapped opportunities may lie if the processing assumptions are challenged. The role of the leaders within the organization is the fundamental element of sustaining the progress of lean thinking. Experienced kaizen members at Toyota, for example, often bring up the concepts of Senpai, Kohai, and Sensei, because they strongly feel that transferring of Toyota culture down and across Toyota can only happen when more experienced Toyota Sensei continuously coach and guide the less experienced lean champions. One of the dislocative effects of lean is in the area of key performance indicators (KPI). The KPIs by which a plant/facility are judged will often be driving behaviour, because the KPIs themselves assume a particular approach to the work being done. This can be an issue where, for example a truly lean, Fixed Repeating Schedule (FRS) and JIT approach is adopted, because these KPIs will no longer reflect performance, as the assumptions on which they are based become invalid. It is a key leadership challenge to manage the impact of this KPI chaos within the organization. After formulating the guiding principles of its lean manufacturing approach in the Toyota Production System (TPS), Toyota formalized in 2001 the basis of its lean management: the key managerial values and attitudes needed to sustain continuous improvement in the long run. These core management principles are articulated around the twin pillars of Continuous Improvement (relentless elimination of waste) and Respect for People (engagement in long term relationships based on continuous improvement and mutual trust). This formalization stems from problem solving. As Toyota expanded beyond its home base for the past 20 years, it hit the same problems in getting TPS properly applied that other western companies have had in copying TPS. Like any other problem, it has been working on trying a series of countermeasures to solve this particular concern. These countermeasures have focused on culture: how people behave, which is the most difficult challenge of all. Without the proper behavioral principles and values, TPS can be totally misapplied and fail to deliver results. As with TPS, the values had originally been passed down in a master-disciple manner, from boss to subordinate, without any written statement on the way. Just as with TPS, it was internally argued that formalizing the values would stifle them and lead to further misunderstanding. However, as Toyota veterans eventually wrote down the basic principles of TPS, Toyota set to put the Toyota Way into writing to educate new joiners. Challenge: Having a long term vision of the challenges one needs to face to realize one's ambition (what we need to learn rather than what we want to do and then having the spirit to face that challenge). To do so, we have to challenge ourselves every day to see if we are achieving our goals. Respect: Taking every stakeholders' problems seriously, and making every effort to build mutual trust. Taking responsibility for other people reaching their objectives. Teamwork: This is about developing individuals through team problem-solving. The idea is to develop and engage people through their contribution to team performance. Shop floor teams, the whole site as team, and team Toyota at the outset. Seeking profit is a relentless focus for Toyota exemplified by the profit maximization principle (Price – Cost = Profit) and the need, therefore, to practice systematic cost reduction (through TPS or otherwise) to realize benefit. Lean implementations can tend to de-emphasise this key measure and thus become fixated with the implementation of improvement concepts of "flow" or "pull". However, the emergence of the "value curve analysis" promises to directly tie lean improvements to bottom-line performance measurements. Tool orientation is a tendency in many programs to elevate mere tools (standardized work, value stream mapping, visual control, etc.) to an unhealthy status beyond their pragmatic intent. The tools are just different ways to work around certain types of problems but they do not solve them for you or always highlight the underlying cause of many types of problems. The tools employed at Toyota are often used to expose particular problems that are then dealt with, as each tool's limitations or blindspots are perhaps better understood. So, for example, Value Stream Mapping focuses upon material and information flow problems (a title built into the Toyota title for this activity) but is not strong on Metrics, Man or Method. Internally they well know the limits of the tool and understood that it was never intended as the best way to see and analyze every waste or every problem related to quality, downtime, personnel development, cross training related issues, capacity bottlenecks, or anything to do with profits, safety, metrics or morale, etc. No one tool can do all of that. For surfacing these issues other tools are much more widely and effectively used. Management technique rather than change agents has been a principle in Toyota from the early 1950s when they started emphasizing the development of the production manager's and supervisors' skills set in guiding natural work teams and did not rely upon staff-level change agents to drive improvements. This can manifest itself as a "Push" implementation of lean rather than "Pull" by the team itself. This area of skills development is not that of the change agent specialist, but that of the natural operations work team leader. Although less prestigious than the TPS specialists, development of work team supervisors in Toyota is considered an equally, if not more important, topic merely because there are tens of thousands of these individuals. Specifically, it is these manufacturing leaders that are the main focus of training efforts in Toyota since they lead the daily work areas, and they directly and dramatically affect quality, cost, productivity, safety, and morale of the team environment. In many companies implementing lean the reverse set of priorities is true. Emphasis is put on developing the specialist, while the supervisor skill level is expected to somehow develop over time on its own. Lack of understanding is one of the key reasons that a large share of lean manufacturing projects in the West fail to bring any benefit. In Factory Physics, Hopp and Spearman describe this as romantic JIT, where the belief in the methods is more important than the actual understanding and results. In this aspect, lean manufacturing is more of a religion than a science. Others have compared it to cargo cult science. The challenge in moving lean to services is the lack of widely available reference implementations to allow people to see how directly applying lean manufacturing tools and practices can work and the impact it does have. This makes it more difficult to build the level of belief seen as necessary for strong implementation. However, some research does relate widely recognized examples of success in retail and even airlines to the underlying principles of lean. Despite this, it remains the case that the direct manufacturing examples of 'techniques' or 'tools' need to be better 'translated' into a service context to support the more prominent approaches of implementation, which has not yet received the level of work or publicity that would give starting points for implementors. The upshot of this is that each implementation often 'feels its way' along as must the early industrial engineering practices of Toyota. This places huge importance upon sponsorship to encourage and protect these experimental developments. Lean management is nowadays implemented also in non-manufacturing processes and administrative processes. In non-manufacturing processes is still huge potential for optimization and efficiency increase. The espoused goals of lean manufacturing systems differ between various authors. While some maintain an internal focus, e.g. to increase profit for the organization, others claim that improvements should be done for the sake of the customer. Improve quality: To stay competitive in today's marketplace, a company must understand its customers' wants and needs and design processes to meet their expectations and requirements. Eliminate waste: Waste is any activity that consumes time, resources, or space but does not add any value to the product or service. Lean production has been adopted into other industries to promote productivity and efficiency in an ever changing market. In global supply chain and outsource scale, Information Technology is necessary and can deal with most of hard lean practices to synchronise pull system in supply chains and value system. The manufacturing industry can renew and change strategy of production just in time. The supply chains take changes in deploying second factory or warehouse near their major markets in order to react consumers’ need promptly instead of investing manufacturing factories on the lost-cost countries. For instance, Dell sells computers directly from their website, cutting franchised dealers out of their supply chains. Then, the firm use outsourced partners to produce its components, deliver components to their assembly plants on these main markets around the world, like America and China. Zara made decision of speeding their fashion to the consumers market by fast-producing cloths within five weeks with their local partners in Spain and never involved in mass production to pursue new styles and keep products fresh. With the improvement of global scale supply chains, firms apply lean practices (JIT, supplier partnership, and customer involvement) built between global firms and suppliers intensively to connect with consumers markets efficiently. After years of success of Toyota’s Lean Production, the consolidation of supply chain networks has brought Toyota to the position of being the world's biggest carmaker in the rapid expansion. In 2010, the crisis of safety-related problems in Toyota made other carmakers that duplicated Toyota’s supply chain system wary that the same recall issue might happen to them. James Womack had warned Toyota that cooperating with single outsourced suppliers might bring unexpected problems. Indeed, the crisis cost a great fortune and left Toyota thinking whether the JIT practice has problems about outsourced suppliers without enough experience and senior engineers could not achieve the monitoring job close to their suppliers out of Japan. That is proven as the economy of scale becomes global, the soft-learn practices become more important in their outsourced suppliers, if they could keep good Sensei relationship with their partners and constantly modify production process to perfection. Otherwise, Toyota begins to consider whether to have more choices of suppliers of producing the same component, it might bring more safety on risk-control and reduce the huge cost that might happen in the future. The appliance of JIT in supply chain system is the key issue of Lean implementation in global scale. How do the supply partners avoid causing production flow? Global firms should make more suppliers who can compete with each other in order to get the best quality and lower the risk of production flow at the same time. Overall equipment effectiveness (OEE) is a set of performance metrics that fit well in a lean environment. Also, PMTS, methods-time measurement, cost analysis and perhaps time study can be used to evaluate the wastes and IT effectiveness in the operational processes. For example, Jun-Ing Ker and Yichuan Wang analyze two prescribing technologies, namely no carbon required (NCR) and digital scanning technologies to quantify the advantages of the medication ordering, transcribing, and dispensing process in a multi-hospital health system. With comparison between these two technologies, the statistical analysis results show a significant reduction on process times by adopting digital scanning technology. The results indicated a reduction of 54.5% in queue time, 32.4% in order entry time, 76.9% in outgoing delay time, and 67.7% in outgoing transit time with the use of digital scanning technology. One criticism of lean is that its practitioners may focus on tools and methodologies rather than on the philosophy and culture of lean. Consequently, adequate management is needed in order to avoid failed implementation of lean methodologies. Another pitfall is that management decides what solution to use without understanding the true problem and without consulting shop floor personnel. As a result, lean implementations often look good to the manager but fail to improve the situation. In addition, many of the popular lean initiatives, coming from the TPS, are solutions to specific problems that Toyota was facing. Toyota, having an undesired current condition, determined what the end state would look like. Through much study, the gap was closed, which resulted in many of the tools in place today. Often, when a tool is implemented outside of TPS, a company believes that the solution lay specifically within one of the popular lean initiatives. The tools which were the solution to a specific problem for a specific company may not be able to be applied in exactly the same manner as designed. Thus, the solution does not fit the problem and a temporary solution is created vs. the actual root cause. The lean philosophy aims to reduce costs while optimizing and improving performance. Value stream mapping (VSM) and 5S are the most common approaches companies take on their first steps towards making their organisation leaner. Lean actions can be focused on the specific logistics processes, or cover the entire supply chain. For example, you might start from analysis of SKUs (stock keeping units), using several days to identify and draw each SKUs path, evaluating all the participants from material suppliers to the consumer. Conducting a gap analysis determines the company's 'must take' steps to improve the value stream and achieve the objective. Based on that evaluation, the improvement group conducts the failure mode effects analysis (FMEA), in order to identify and prevent risk factors. It is crucial for front-line workers to be involved in VSM activities since they understood the process and can directly increase the efficiency. Although the impact may be small and limited for each lean activity, implementing a series small improvements incrementally along the supply chain can bring forth enhanced productivity. After adopting the lean approach, both managers and employees experience change. Therefore, decisive leaders are needed when starting on a lean journey. There are several requirements to control the lean journey. First and most importantly, experts recommend that the organization have its own lean plan, developed by the lean Leadership. In other words, the lean team provides suggestions for the leader who then makes the actual decisions about what to implement. Second, coaching is recommended when the organization starts off on its lean journey. They will impart their knowledge and skills to shopfloor staff and the lean implementation will be much more efficient. Third, the metrics or measurements used for measuring lean and improvements are extremely important. It will enable collection of the data required for informed decision-making by a leader. One cannot successfully implement lean without sufficient aptitude at measuring the process and outputs. To control and improve results going forward, one must see and measure, i.e. map, what is happening now. Lean manufacturing is different from lean enterprise. Recent research reports the existence of several lean manufacturing processes but of few lean enterprises. One distinguishing feature opposes lean accounting and standard cost accounting. For standard cost accounting, SKUs are difficult to grasp. SKUs include too much hypothesis and variance, i.e., SKUs hold too much indeterminacy. Manufacturing may want to consider moving away from traditional accounting and adopting lean accounting. In using lean accounting, one expected gain is activity-based cost visibility, i.e., measuring the direct and indirect costs at each step of an activity rather than traditional cost accounting that limits itself to labor and supplies. ^ a b Womack, James P.; Daniel T. Jones; Daniel Roos (1990). The Machine That Changed the World. ^ a b Holweg, Matthias (2007). "The genealogy of lean production". Journal of Operations Management. 25 (2): 420–437. doi:10.1016/j.jom.2006.04.001. ^ Bailey, David (24 January 2008). "Automotive News calls Toyota world No 1 car maker". Reuters.com. Reuters. Retrieved 19 April 2008. ^ Krafcik, John F. (1988). "Triumph of the lean production system". Sloan Management Review. 30 (1): 41–52. ^ Ohno 1988, p. 8. ^ a b c Womack & Jones 2013. ^ Spear, Steven; Bowen, H. Kent (September 1999). "Decoding the DNA of the Toyota Production System". Harvard Business Review. ^ Shingo, Shigeo (1987). The Sayings of Shigeo Shingo: Key Strategies for Plant Improvement. Taylor & Francis. ISBN 9781563273841. ^ Ford, Henry; with Crowther, Samuel (1922). My Life and Work. Garden City, New York City: Garden City Publishing Company, Inc. Various republications, including ISBN 978-1-4065-0018-9. Original is public domain in U.S.
^ Bennett, Harry; with Marcus, Paul (1951). We Never Called Him Henry. New York: Fawcett Publications. LCCN 51036122. ^ a b Ruffa, Stephen A. (2008). Going Lean: How the Best Companies Apply Lean Manufacturing Principles to Shatter Uncertainty, Drive Innovation, and Maximize Profits. AMACOM. ISBN 0-8144-1057-X. ^ Hounshell, David A. (1984), From the American System to Mass Production, 1800-1932: The Development of Manufacturing Technology in the United States, Baltimore, Maryland: Johns Hopkins University Press, ISBN 978-0-8018-2975-8, LCCN 83016269 pp 248 ff. ^ Ohno 1988, p. 58. ^ Bicheno, John; Holweg, Matthias (2009). The Lean Toolbox. PICSIE. ISBN 978-0-9541244-5-8. ^ Smalley, Art (2005). "TPS versus Lean and the Law of Unintended Consequences". Lean Enterprise Institute. ^ Adsit, Dennis (11 June 2007). "Cutting-Edge Methods Help Target Real Call Center Waste". iSixSigma.com. Archived from the original on 14 April 2008. ^ Alkalay, M.; Angerer, A.; Drews, T.; Jäggi, C.; Kämpfer, M.; Lenherr, I.; Valentin, J.; Vetterli, C.; Walker, D. (2015). Walker, Daniel (ed.). The Better Hospital: Excellence Through Leadership And Innovation. Medizinisch Wissenschaftliche verlagsgesellschaft. ISBN 9783954662241. ^ Radnor, Zoe; Walley, Paul; Stephens, Andrew; Bucci, Giovanni (2006). Evaluation of the Lean Approach to Business Management and ITs Use in the Public Sector (PDF). Scottish Executive Social Research. ISBN 0755960564. ^ "Shining examples". Special report: Logistics: The Economist. June 15, 2006. ^ a b c Akinlawon, Akin O. "Thinking of Lean Manufacturing Systems". SAE International. ^ a b Hopp, Wallace; Spearman, Mark (2008), Factory Physics: Foundations of Manufacturing Management (3rd ed. ), ISBN 978-0-07-282403-2. ^ Pederson, Joseph. "Author". the business dude. WordPress.com. Archived from the original on 27 April 2014. Retrieved 27 April 2014. ^ Merrill Douglas (June 2013). "The Lean Supply Chain: Watch Your Waste Line". inboundlogistics. Retrieved 22 February 2017. ^ Nash-Hoff, Michele. "Why Lean Manufacturers Are Not Lean Enterprises". Industryweek.com. Industryweek.com. Retrieved 1 May 2015. MacInnes, Richard L. (2002) The Lean Enterprise Memory Jogger. Page, Julian (2003) Implementing Lean Manufacturing Techniques. Wikimedia Commons has media related to Lean manufacturing.